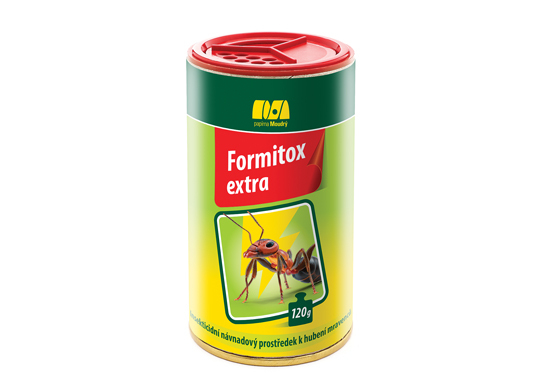 Formitox Extra – a bait for ants | Papírna Moudrý, s.r.o. FORMITOX EXTRA is a special formulation. It effectively exterminates and gets rid of all kinds of ants. Ants often enter buildings in search of food and water, warmth and shelter. The formulation attracts ants quickly and it is fast acting. After the ants feed on the bait, the insects die. There is a sliding open/close button on the lid of the container. Open it and apply the product directly onto the surface. When the work is finished, close the container. Crystalline powder: Carefully pour 1-2 grams of crystalline powder onto a paper, plastic or glass sheet. Traps should be placed where ants are likely to occur, but out of the reach of children and pets. Aqueus solution: Dissolve 2-4 grams of crystalline powder in 100 ml of water. Pour the mixture into shallow bowls made of glass or plastic and place them where the insects are expected to occur. After the insects feed on the bait, die soon. Both ways of application are equally effective. Prevent the access to the areas treated with FORMITOX EXTRA by children, domestic and farm animals. Manipulation is simple and easy. It provides almost immediate result. The effect of the used crystals does not exceed 21 days.